Our company is engaged in the installation of vinyl windows, installation and replacement of interior and exterior doors. Our company can advise you on all important issues of installation and replacement of doors and windows. Our experts deal with the sale of our products, answering all requires of our customers. The company Windows & Doors Replacement guarantees the highest quality of services provided! We will offer the best windows and doors for your comfort. Our company provides the best quality of Vinyl Windows replacement, Insulated Steel Entrance Doors, Fiberglass Entry Door System, Sliding Doors, Garden and French Doors, Porch Enclosures and Patio Doors to residents of the Greater Toronto Area. You can choose what you want to set or buy. Available products for your home are Vinyl Windows, Entry Doors, Porch Enclosures, Patio Doors, and Vinyl Sidins & Eavestrough. Save time and money for your next home improvement project - receive a quote for replacement windows online with just a few clicks! View free quotes for vinyl windows replacement at home instantly in your web browser. There is no obligation to purchase our products. We are working only with contractors that have completed thousands installations works. We provide fiber glass and steel entry doors for the residences of Toronto and Greater Toronto Area, replacement of doors of feature. Our steel doors are less expensive, paintable entry doors which require a very low maintenance, they require very minimal maintenance. Sliding doors, door coupe - the door that at opening move to the side, at the same time moving steadily. Sliding doors can be used as a partition, for example between room and a kitchen. They are often used in stores, large shopping complexes and public transportation, as their design responds well to automation. Also sliding doors are the determining element in the wardrobe. Vinyl siding is an excellent choice for those homeowners who want to enhance the life and value of their home without painting. This exterior cladding offers an excellent way to protect your home with least effort and expense, besides they don't require any extra maintenance. We can advise you about each of the services. Our company will provide you any of the above services. You can get some detailed information from the website. And have in-home consultation and estimate for vinyl windows replacement, entry doors, porch enclosure and patio doors. 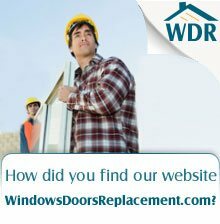 Why Windows & Doors Replacement? Our company guarantees you an excellent quality of work. Also on our website you can see examples of executed works. We can provide a wide range of energy efficient products. All of our clients are satisfied with the performed work. We have reliable suppliers that provide us qualitative materials only. Why is it necessary to change the window? best value for money and service life. Why is it necessary to change doors? Using our site you were able to familiarize with offers of Windows & Doors Replacement and choose the service of interest. Our company can guarantee quality of service and provided services. We are not afraid of our competitors. You may check their web sites (see ad below) to make sure that WDR is the best in this field and we can beat our competitors in every category.